Adherence: Did I Follow Through? 2:00 Tightness worsening then dissipating somewhat. 6:00 Tightness not worse at 6min but visible curve in my lumbar spine when looking at it from the side in the mirror. 10:00 Still uncomfortable in the same place but tolerable. Not yet meeting the goal of no discomfort but an improvement from two weeks ago. 8:10 Definitely feel my back creeping into more and more lumbar flexion. The ache is spreading across my back but thintensity is still very low. ROM Tests: Did I Get More Flexible? Hip external and internal rotation at 90 of hip flexion, hip external rotation at full hip flexion and the FABER test. 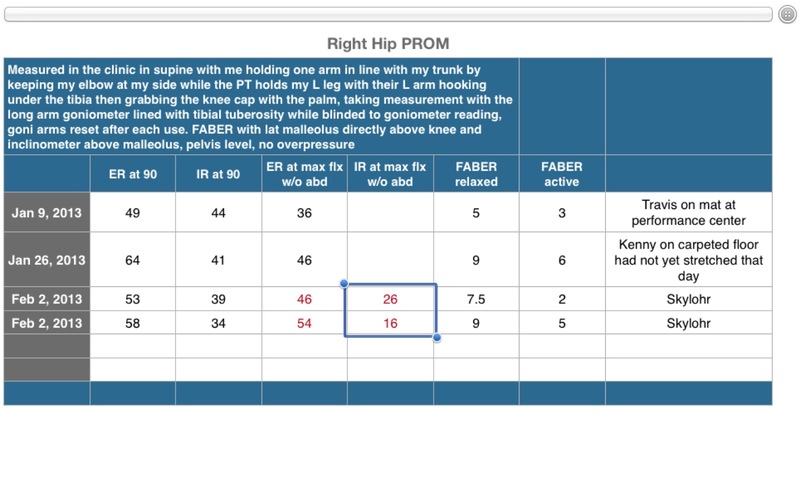 (I picked these assessments because they are standard goniometric measurements which closely mimic the hip flexion and external rotation required to sit cross legged with a straight spine. These measurement are commonly used in physical therapy and shown to have an error range of 5 degrees. I had my friend Skylohr who is a PT student test my hip range of motion before and after stretching my left hip. I went to the other room to do the stretch and Skylohr was blinded to the intervention. He had no idea what I was going to do or what the point of measuring my hip range of motion was, he had not read my blog post. Thanks to Skylohr for being willing to take the time to do this, i had a hard time finding PTs with time to do this. The result of doing 3 minutes of z-stretch on the left hip was a 15 degree increase in hip external rotation at maximal hip flexion. It also improved my FABER. The measurement error looks fairly wide given the difference in all pre-post values. 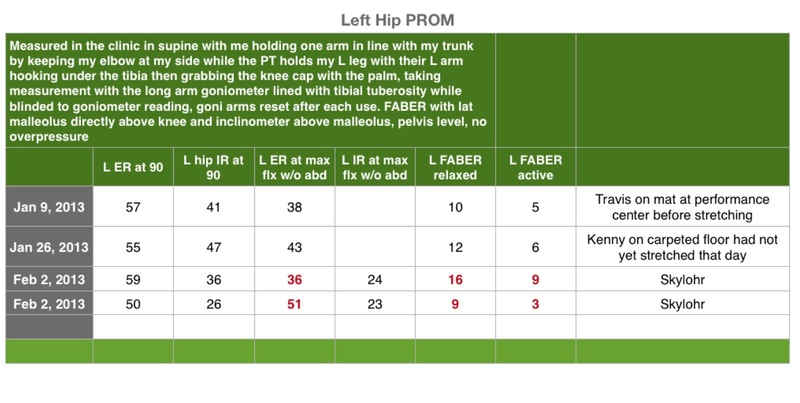 My right hip rotation increased and I don’t know if this is the result of the measurement error or the fact that the back leg is getting stretched in abduction and internal rotation during the z-stretch. Overall it seems like the stretch improves the range of motion it intends tout the skeptical side of me is not satisfied. -I have doubled the stretch duration but not the frequency because I want to find and effective intervention that is still convenient. 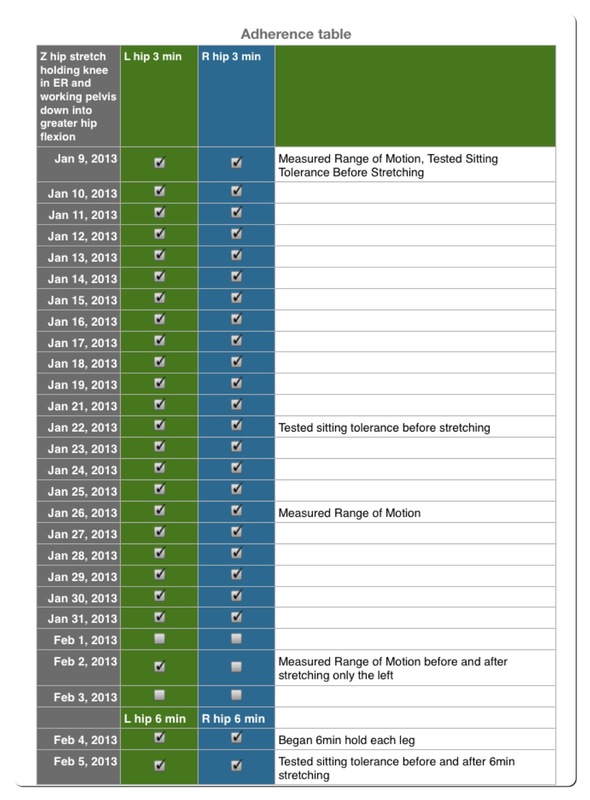 -If still no increase in two more weeks, replace Z stretch with hip ER in full flexion. -I will post an update when I have my ROM re-measured.